TACLOBAN CITY – The University of the Philippines Visayas Tacloban College (UPVTC) triumphed over St. Paul’s School of Professional Studies (SPSPS) in the 2nd match of the Preliminary Rounds of the 2018 Intercollegiate Federalism Debate (Tacloban City/Leyte leg) hosted by the Department of the Interior and Local Government (DILG) at the 2nd floor, Student Center, Leyte Normal University on March 21, 2018. Leonardo Dimatangal of UPVTC also stood out among other debaters by bagging both the Best Debater and Best Speaker medals. The teams argued on the following proposition, “Resolve that the country shall adopt a unicameral legislature in a federal system of government”, with SPSPS taking the affirmative stand and UPVTC tasked with the negative viewpoint. The UPVTC team was composed of Brandon Ian Dela Cruz, Leonardo Dimatangal, Jeffrae Isaac Albert Damayo, and Gio Martin Ocfemia, with Prof. Dakila Yee as the coach; while the SPSPS team was composed of Jejomar Bru, Glydel Jain A. Tacad, Joshua V. Baldo, and Gil Kristopher C. Rosillo, mentored by Atty. Jose Aguinalde. Prof. Arvin de Veyra moderated the debate, which aired live over DYVL AksyonRadyo Tacloban and on the DILG Region 8 Facebook page. The panel of judges were from the Integrated Bar of the Philippines - Leyte Chapter, Atty. Karah Jane A. Tamboong, Atty. Vincent Q. Piga, and Atty. Romeo Dax Calamaya. UPVTC will be joining the quarterfinals with the rest of the winning colleges all over the region. The quarterfinal rounds of the debate are scheduled on April 2 for the match between Leyte Normal University (LNU) and Maasin City College (MCC); April 4 for Visayas State University (VSU) vs. Naval State University (NSU); April 11 for the match between University of Eastern Philippines (UEP) and Eastern Samar State University (ESSU); and April 16 for the debate between UPVTC and Samar College. The semi-finals and grand finals are to be scheduled within the same month. 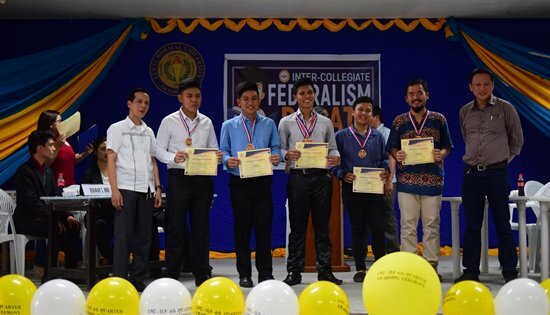 The 2018 Intercollegiate Federalism Debate is one of DILG Region 8’s responses to the President’s directive for the department to lead the information campaign on Federalism. Recognizing that the youth predominantly compose the voting population, DILG-8 decided to gear many IEC activities towards this age group. A debate on the merits and details of Federalism hopes to bring about improved awareness, knowledge, discussion, and appreciation of Federalism and other forms of government, and at the same time promote a culture of discussion on Federalism and relevant issues among various audiences.